Right now in the shop we have a great pair of Georgian "torpedo" earrings. These elongated gold drop earrings were popular in the 1820s and 30s, and often decorated with intricate cannetille wirework. Georgian "torpedo" earrings in 15k yellow gold with cannetille rosettes and fluted dangles. c. 1830. Available for sale at Gray & Davis. "Young Brunette Woman," oil on canvas, British School 1830s. Offered by Hillcrest Collections via 1st dibs. Senora Manuela Suarez Lastra de Garmendia (1800 - 1875) by Pellegrini. Quite a name and quite a hairdo! We always enjoy singing the praises of old cut diamonds. We love these sparkly stones because they aren’t perfect, and were cut by hand with great care using the technologies of their day. Georgian five old mine cut diamond ring in silver and 18k gold, at Gray & Davis. Art Deco 1.04ct old European cut diamond ring in 18k white gold, at Gray & Davis. In the 19th century to the early 20th century, from whence most of our antique diamond jewelry hails, we mainly see two types of diamond cuts: the old mine cut and the old European cut. They lack the mathematical, machine-cut precision you see in modern gems. However, old world lapidaries knew what they were doing. They studied the rough mined diamond and cut stones to maximize their brilliance as best they could. Old European cut diamonds represent an evolution of this cutting style, and started appearing in the late 19th century. Diamonds became more round, and more facets were cut to increase sparkle. The tops, or crown angles, were made shallower, and diamond cutters came closer and closer to bringing diamond pavilions to a perfect point. Thus, culets became smaller and smaller; eventually technology rendered them nonexistent. This is seen in modern brilliant cut diamonds. One of the easiest ways to guess if your diamond is antique just requires your naked eye. Stare right down the center of the stone. Old mine cuts will look like they have a little dot in the center because you can see down to the culet facet. You can also see the tiny culets of old European cut diamonds, though sometimes you need a jeweler’s loupe because the pavilion comes close to a perfect point. What's on your holiday dinner table? Be it seven fishes or seven cartons of Chinese takeout, it's surely steeped in tradition. Several classic Christmas recipes (roast beast anyone?) began appearing a few centuries ago and were made around the same time as our antique jewelry. So, put on your favorite gems and pour yourself a glass of egg nog (enjoyed since the Middle Ages)! It's party time. A Georgian holiday table might feature marrow bones, mince pies, roast pig and fowl and some sort of baked fruit dessert. We now consider this dinner a bit rustic, but most holiday dinner staples such as a roast turkey and pie date to this era, if not before. Georgian Enamel, pearl and rose cut diamond ring, at Gray & Davis. A Georgian five diamond ring in silver and 18k yellow gold, at Gray & Davis. Victorian literature gives us a taste of what could be found for a 19th century holiday table. Christmas dinner was meant to be the finest meal of the year. Roast poultry, oyster stuffing, and plum pudding were staples. It is said that Prince Albert's sweet tooth is the reason for pudding's place at the royal feast and, subsequently, at almost every English Christmas meal. Just as several jewelry trends were swayed by Victoria's tastes, so too was the preference for rich dessert encouraged by Albert. Victorian watch fob and nested snake ring, available at Gray & Davis. Diamond snake ring is available in our online shop. 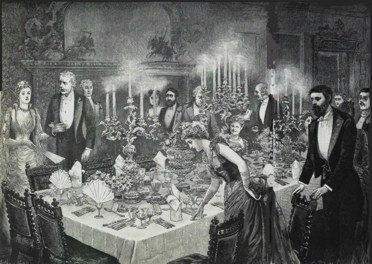 An Edwardian dinner party, bathed in candlelight. Edwardian paste dangle earrings, silver on 14k gold, available in our online shop. The Art Deco period coincided with the American prohibition of alcohol sale and consumption, though we know this stopped few from enjoying a tasty tipple. Cocktails such as the French 75, whose recipe was published in 1930 and features a festive champagne float, and the Bee's Knees, meant to take the edge of bathtub gin with soothing lemon and honey, are still being mixed in restaurants today. And, they are perfect for holiday festivities. An Art Deco era holiday party. 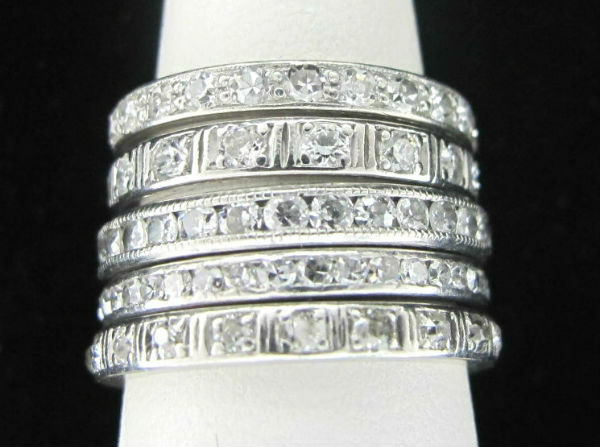 A fabulous stack of Art Deco eternity bands, available at Gray & Davis, and in our online shop. 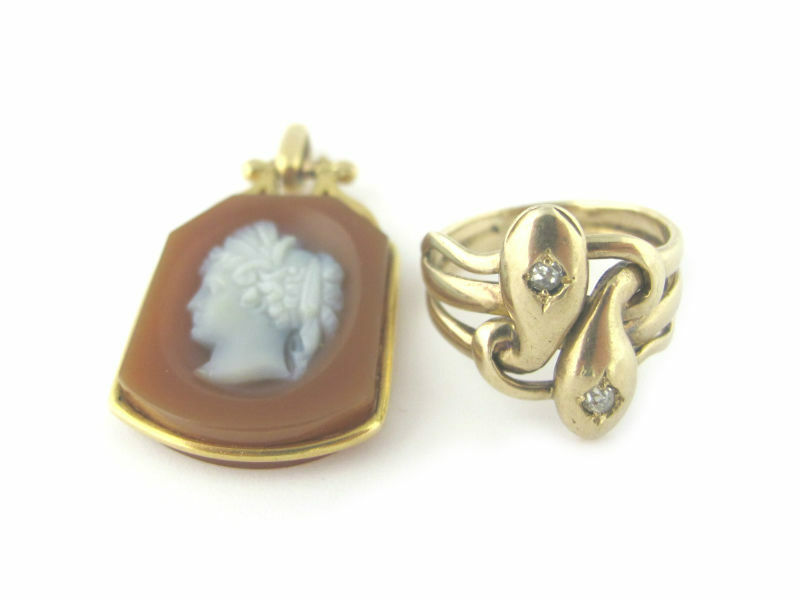 For those who know that half the fun of wearing antique jewelry is telling stories about it! This pin would look just as much at home on a lapel of your tweed jacket as it would on the Victorian tourist that picked it up as a Scottish souvenir. Pretty tartan patterned enamel is studded with two yellow glass “paste” stones and crowned with a pale yellow citrine at the hilt. Extra points if you can name the clan it was meant to represent. Victorian sterling silver pin with citrine, enamel and yellow pasts. Available at Gray & Davis. Georgian Stuart Crystal earrings in silver, 14k gold, made c.1820. Available at Gray & Davis. Clear rock crystal is set atop a gold-wire monogram backed in pink foil in these Georgian earrings. Stuart crystal jewelry was first worn in secret support of King Charles I after his execution in 1659. The style caught on, and soon “Stuart” crystals were made in memorium for all sorts of individuals (we’re not sure whose initials are written in this specific pair). Check out all of our Gift Guides here. Two blocks away from the Rockefeller Center Christmas tree, and right around the corner from all of the decorated shop windows on Fifth Avenue, 47th Street in December feels like it’s right in the middle of all the celebration. If you find yourself in the neighborhood soaking in the holiday splendor, come visit our booth and take a peek at some antique treasures. We've picked out five kinds of pieces that no antique collector's jewelry box should be without. Arts and Crafts Carnelian and Enamel Ring, available in our online shop. This ring shows its age in all the best ways. A large, table cut red carnelian, one of the oldest stones used in jewelry making, is surrounded by a halo of tri-colored enamel work. The enamel continues down the sides of the ring, as well. This Arts & Crafts era piece sits broad and low, catching the eye without weighing you down. A great old gem for a modern gal. A classic style that never goes out of fashion, these two rings have very different looks with the same core design. This Victorian gypsy-set ring is a set horizontally; a simple line of diamonds in 18k yellow gold. This Edwardian ring has stones running vertically on the finger, with a delicate halo of rose cut diamonds in platinum and a thin band of 18k yellow gold. Victorian Three Diamond Gypsy Ring, available in our online shop. Edwardian Triple Diamond Ring in Platinum and 18K Gold, available in our online shop. Antique jewelry with diamond simulants was crafted with the same care as pieces made with the actual gemstone. These charming dangle earrings are set with “paste” stones, glass made and faceted to sparkle almost as brilliantly as its diamond counterpart in candlelight. 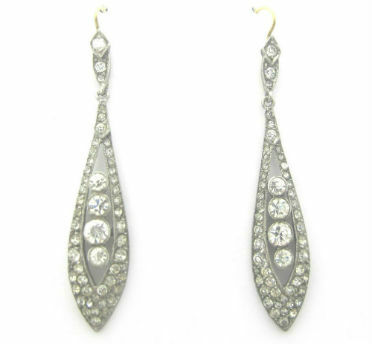 With a simple silver collet setting, these earrings are great for daily wear. Victorian 14K Gold Long Chain, available in our online shop. One great long chain is the gateway to so many looks. With handmade, antique chains, the fine detail work makes these pieces suitable for wearing as is, or with a plethora of pendant options. This 14k chain has alternating flat and round links. At 68” inches long, it is perfect for doubling or even tripling up, and a large 14k gold swivel is just waiting for your favorite pendant. Learning when an antique piece was made takes study and practice. However, some jewels easily reveal the past through their hallmarks. Several countries used letters or symbols to denote when a piece was assayed. 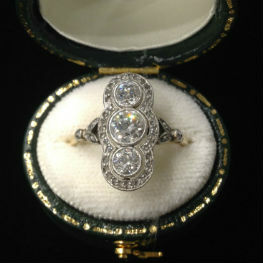 With a little bit of research, we learned that this pretty gold and diamond ring was made in 1882. It was assayed in Chester, and thus was most likely made in central England. The hallmarks even reveal the metal the piece was fashioned in; this ring is 15k gold. Victorian 15K Gold and Five Diamond Ring. available in our online shop. Check out all of our Gift Guides here!